. : Optics & Photonics Focus :: The Spooky Physics of Entanglement :. High-speed cameras can film a bullet passing through an apple. Chemical reactions, however, are far too fast even for the best cameras. Attosecond physics promises new approaches to study and manipulate them. Spooky action at a distance. How can two photons be correlated over a distance? If the photons communicated with each other, they would have to do so at an unbelievable speed, maybe instantaneously, researchers from Geneva conclude. If we want to know how our friends are doing, we can, for example, call them or send them an email. Such communication technologies involve sending signals from one place to another. According to the laws of quantum physics, however, two friends could be connected using a different concept: entanglement. While communication takes time, entanglement appears to happen instantaneously, and needs no signaling between the two parties. According to Einstein's general theory of relativity, however, the speed of light constitutes a fundamental speed limit that nothing should be allowed to break. He, therefore, did not like the idea of entanglement, and dubbed this phenomenon spooky action at a distance. Now researchers led by Nicolas Gisin at the University of Geneva (Switzerland) have measured that this effect indeed seems to be instantaneous — or to have a speed at least ten thousand times faster than the speed of light. "According to Newton's universal gravity theory," Gisin explains, "if a stone is moved on the moon, our weight here on Earth is immediately affected. Hence, Newton's theory predicts actions at a distance, something Newton was well aware of and deeply disliked. Today we know that Newton's law is only an approximation and that the better theory of general relativity avoids actions at a distance. According to Einstein's general relativity, when a stone is moved on the moon it takes about one second before our weight on Earth is affected." Physics takes time: as a general rule, some time will always elapse between the moment something happens somewhere in the Universe and the moment we can perceive its effect. Usually, if something appears to spread instantaneously from one point to another, it is due to a lack of precision in our measurements. During a thunderstorm, for example, we mistakenly believe that we see flashes of lightning at the exact moment that they happen. Even though it is true that they reach us extremely quickly due to the immense speed of light, our perception is not instantaneous. In quantum mechanics, however, there is a phenomenon that still appears to be genuinely instantaneous: entanglement. Two objects, according to quantum mechanics, can be correlated intrinsically and, whenever one changes, the other will change accordingly — and with no time delay. Einstein and many other physicists of his time found this fact so absurd that, as a result, they deduced that quantum mechanics could not be a complete, valid, or even serious physical theory, but merely a simplified version of a more profound description of nature. Entanglement is simply correlation. For example, two entangled coins could always land on the same side or on different sides, exactly as two entangled photons might always have the same polarization or perpendicular polarizations. The important concept is that the outcome of the measurement of two different physical objects can be correlated. Quantum physics is even richer: a quantum coin could be in any superposition of heads or tails, as a photon can be in any superposition of horizontal and vertical polarization. Let us explore this concept further. Take, for example, two entangled photons, A and B, or for the sake of creativity, Alice and Bob — the usual names chosen amongst quantum physicists. We can ask the photons to tell us whether their polarization is horizontal/vertical, or whether it is diagonal/antidiagonal. If they are correlated, Alice and Bob will always give the same answer to the same question. If asked different questions, however, Alice and Bob will give completely uncorrelated, random answers. Of course, if Alice and Bob can hear each other, they can easily generate a correlation. As soon as Bob hears what Alice says, he knows what to answer: if we ask him the same question, he will give the same answer, and if not, he can choose freely what to say. Trying to impede communication is difficult since Alice and Bob can resort to any type of communication they like. For example, if we separate them, they could use radio, email, or even smoke signals. Impeding communication is important to make sure that entanglement is not a trivial classical phenomenon. To be completely sure that Alice and Bob cannot communicate, we have to ensure that they do not have time to talk to each other. Practically, this can be done by placing them far apart and recording their answers quicker than they could possibly communicate. The recording, therefore, has to be faster than the time it takes for light to travel from Alice to Bob, because Einstein's theory of general relativity states that no communication can happen faster than the speed of light. If, for example, Alice is on the Moon and Bob is on Earth, the questions have to be answered in less than one second. If the correlations vanish after all these precautions are taken, it is very probable that Alice and Bob were merely communicating classically. If, however, the correlations persist, we may be tempted to think that something spooky is going on between Alice and Bob. Excluding signaling, however, is not enough to prove entanglement. Even though they are incommunicado, Alice and Bob could make us believe that they are entangled by agreeing beforehand on the answers. Luckily, the right combinations of questions and a careful statistical analysis permits us to exclude this possibility. In other words, if during this analysis certain mean values exceed a given threshold, it is impossible for Alice and Bob to have decided on their actions beforehand. This concept is expressed by a set of equations called the Bell inequalities, after John Bell who initially proposed them in 1964. On top of impeding communication, they are the second cornerstone to experimentally showing entanglement. Gisin and his collaborators took pairs of photons and sent them into different directions using optical fibers. The places where the two measurements were taken were 18 km apart, giving them enough time to perform the measurements while excluding communication between the two photons. Analysis of the correlations between the photons, corresponding to the Bell inequalities, was then performed extensively and showed violation of these inequalities at all times of day and night. They could, therefore, conclude that it is impossible to explain their experimental results assuming communication or classical correlations generated at the source of the photons. In other words, they experimentally showed that they have entangled photons — at least if we assume that communication cannot happen faster than, as estimated in their experiment, 10'000 times the speed of light. 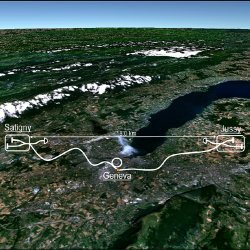 "I believe," Gisin states, "that improved mastering and understanding of entanglement will ultimately allow us to send entanglement over intercontinental distances and, hopefully, to understand how Nature manages to have two distant events correlated in an impossible way according to local causes." These basic scientific advances will also have a direct impact on practical applications. Recently, for example, quantum entanglement has been used for quantum cryptography and quantum key distribution, providing encrypted communications that are intrinsically safe. "It is important to verify our theoretical models experimentally," Sandu Popescu from the University of Bristol (United Kingdom) remarks. "The experimental results are supporting theoretical predictions, so even if they are not surprising from this point of view, they are important for basic science." "After measuring entanglement over 18km," John Rarity from the University of Bristol (UK) says, "the tendency is to do similar experiments using different satellites and therefore going to even considerably larger distances between the measurements." This would further improve our possibilities to study entanglement. "Another interesting direction I see in research," Rarity adds, "is to put the two observer stations to different gravitational potentials in order to test how gravity and quantum mechanics go together." The fascination of quantum mechanics therefore persists, as Gisin says, "I wonder how these two space-time locations out there can know about what happens in each other without any sort of communication." HG is currently working on his PhD on quantum electrodynamics at ICFO - The Institute of Photonic Sciences in Barcelona (Spain). Daniel Salart, Augustin Baas, Cyril Branciard, Nicolas Gisin, and Hugo Zbinden, Testing the speed of 'spooky action at a distance', Nature (2008) 454, 861-864 (link).